Bark cloth, also called "Na cloth", "paper mulberry bark cloth" and "grain husk cloth", is mainly distributed in south-central part of Li Minority’s inhabiting area. Bark cloth is a kind of non-woven fabric, processed and made from barks by beating. Before using flax or bombax cotton to weave cloth, ancient people had experienced a quite long "no-woven" period. 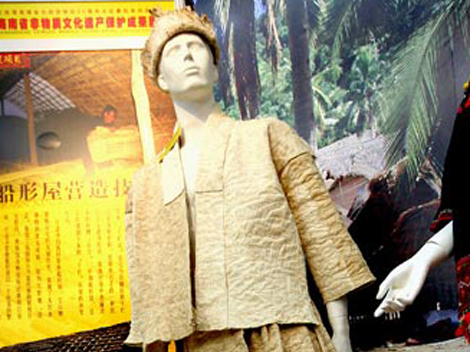 Later on, the ancient Li people found such coarse fiber "bark cloth" was a kind of good material to make clothes. From then on, they began to use it to make clothes to cover body, and make bedspreads, waistbands, etc. Bark cloth has a long history. It is recorded in ancient books that bark cloth appeared in Hainan Island over 3,000 years ago. It is known from Scripture of Eastern Han Dynasty that as early as the Han Dynasty the bark cloth was used to make hats. At that time, the minority groups in border areas also used bark cloth to make clothes and quilts. 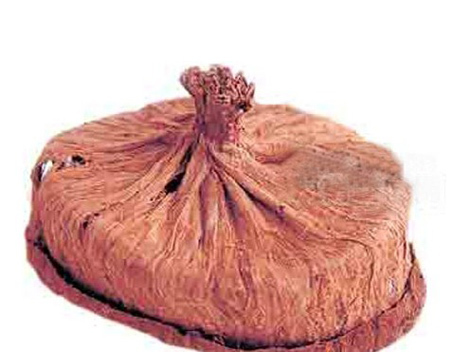 The "paper mulberry hats" and "grain husk clothes" recorded in ancient books were just made of bark cloth. In the inhabiting area of Li Minority, there are numerous kinds of barks that could be processed, such as that of Lannea grandis, Huangjiu tree, antiar, paper mulberry tree etc. Among them, paper mulberry tree is called "tree" in old times. Bark clothes making process is very complicated, including peeling, trimming, immersing barks in water to degum, rinsing, drying, beating barks into slices and then sewing. Then, people will use the processed bark cloth to make hats, pillows, quilts, clothes, skirts, loin cloth, bags and other living articles. Though the work is completed by many procedures, a few tools are used. In these tools, the ones used for hammering are of the greatest importance. 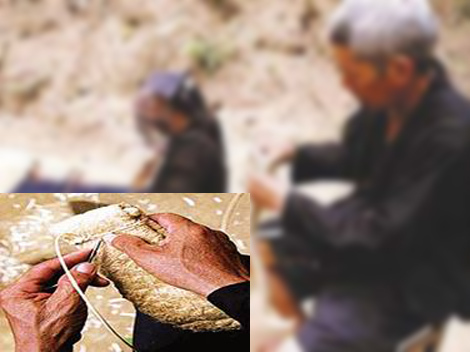 Stone hammer is one of the tools used for bark cloth making, and is also a symbol of bark cloth culture.